Whenever an encounter with Anansi ends, if the Runner did not break all subroutines on it, do 3 net damage. subroutine Look at the top 5 cards of R&D and arrange them in any order. subroutine You may draw 1 card. The Runner may pay 2credit to draw 1 card. If the Runner bypasses Anansi with an encounter bypass ability (e.g. Inside Job), does Anansi still do 3 net damage? Yes. Bypassing causes the encounter to end immediately, which is the trigger condition for Anansi's ability. If the Runner bypasses Anansi with an approach bypass ability (e.g. Charlatan), does Anansi still do 3 net damage? No. If the Runner bypasses the ice as it is being approached, they immediately pass it without encounter it, so there is no encounter that has ended. Can the Runner use Hunting Grounds to prevent Anansi's ability? No. Anansi has a "when encounter ends" ability, not a "when encountered" ability. If Anansi is derezzed or uninstalled during an encounter, does it still do 3 net damage? No. Anansi is no longer active in either case, so its ability cannot trigger. A very interesting ice, both in its subs and everything else. Let's take a look at it. First off, the bad. It does not end the run and is therefore pretty porous. Not unheard of in Jinteki though. 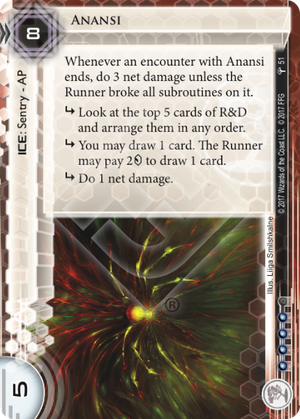 It also has a pretty respectable 8 rez cost, which means it has to be compared to DNA Tracker, an ice that has been a staple in Jinteki decks every since its release. Also, 4 influence, so pretty hard to splash. That's it really. On to the great. This card is up there with DNA Tracker, Komainu and Chiyashi as one of the absolute worst jinteki ice to face check. Not only does it give the corp a chance to stack R&D in their favor, it also deals 4 net damage. If you ever had any desire to just run servers without a sentry breaker against Jinteki (you brave fool), you should definitely reconsider. The real kicker comes in the fact that the 3 net damage is not a sub, but an ability that fires IF the runner did not break every sub on this card. That is amazing, because while low on money the runner might be inclined to just let the corp draw one and/or take 1 net, and just break the R&D sub. But because of this, the runner really has no choice but to break this every time, unless they want to lose 3 cards every time they go through this. Not only that, but some of the best ways to deal with expensive ice are ineffective against this card. Want to use Security Nexus? Take 3 net damage. Femme it to bypass? Take 3 net. Lustig? Take 3 net. Inside Job? To the heap with those cards. And to add icing on the cake, this is not a "when encountered" ability, so Hunting Grounds does nothing against this,. So what it comes down, is that there really is no cheap way to deal with this card. The only breaker that goes through this for a reasonable amount of money is Switchblade, a card never seen outside of Ele "Smoke" Scovak: Cynosure of the Net. So your options are paying through the nose to get past this, or lose a significant portion of your grip. Or use Golden to derez it, but then you're... playing Golden. This card will definitely find a home inside of net damage decks, and become (nearly) as popular as DNA Tracker.